The USA Motocross Team of Ryan Villopoto, Ryan Dungey and Blake Bagget, had their backs against the wall and were on the verge of losing the Chamberlain Trophy, the coveted symbol of world motocross supremacy that had been theirs since 2005. Villopoto and Dungey dug deep in to their vast riding arsenal to pull off a classic 1-2 windup in the MX1 + Open finals to retain the title during the 65th edition of the Monster Energy FIM Motocross of Nations held on September 18 at the Saint Jean d’Angely in France. The 2011 Monster Energy FIM Motocross of Nations champion Motocross Team USA (center) of Ryan Villopoto, Ryan Dungey and Blake Bagget are flanked by second placer Motocross Team France (left) of Steven Frossard, Marvin Musquin and Gautier Paulin and the third placer Motocross Team Australia (right ) of Chad Reed, Matt Moss and Brett Metcalfe. Representatives from the FIM, Youthstream and local sporting dignitaries graced the prize giving ceremony. Joining the winners on stage were (front row- left of the winners) French Olympic Committee Representative Jean Pierre Mougin, FIM Asia President Stephan Carapiet (front row -right of the winners) - Youthstream Vice President and Business Development Director Luigi Zompetti, FIM CMS Director Wolfgang Srb, Jacques Bolle, President Federation Francaise de Motocyclisme (FFM) and FIM Deputy President Jorge Viegas. With the win, the Americans extended their winning streak to 7 years in a row and their total to 22. The French Motocross team of Steven Frossard, Marvin Musquin and Gautier Paulin fell a tad short of winning the title on their home turf as they failed to match the Americans in the payoff moto. The Australian team of Chad Reed, Matt Moss and Brett Metcalfe had reason to celebrate as they secured their first ever podium finish in the MXoN. 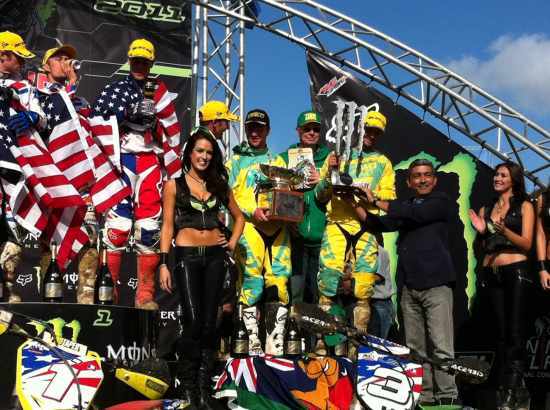 FIM Asia President Stephan Carapiet awarding the third place overall trophy to Motocross Team Australia of Chad Reed, Matt Moss and Brett Metcalfe. 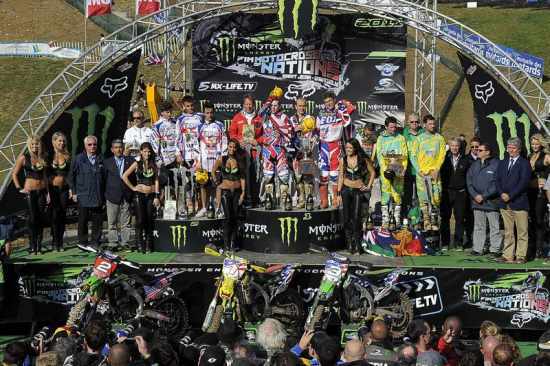 For more information on the FIM Motocross of Nations and other FIM events, visit www.motocrossmx1.com and www.fim-live.com.